A “Kimmel in the Community” team spent the afternoon on May 29, 2013, at the Living Classrooms Foundation on Caroline Street in East Baltimore and helped clean up its East Harbor campus. 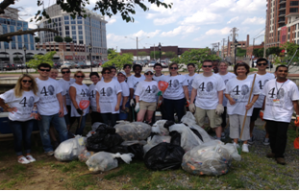 As part of the Kimmel Cancer Center’s 40th anniversary celebration, the volunteers, led by Center Director Dr. Bill Nelson, walked the campus and traveled its waterways in paddleboats, nets in hand, and removed more than a dozen bags of garbage from the campus’ wetlands. Read more about the Kimmel Cancer Center's 40th Anniversary.